An upstate New York helicopter struck power lines during repair work and crashed killing two occupants, injuring two others. The chopper was carrying four people, including utility workers when it hit wires on Burke Road in Beekmantown, NY, around 4:15 p.m. on Tuesday. The Federal Aviation Administration said that after Aerospatiale AS355 struck the wires just south of the Canadian border, it burst into flames. 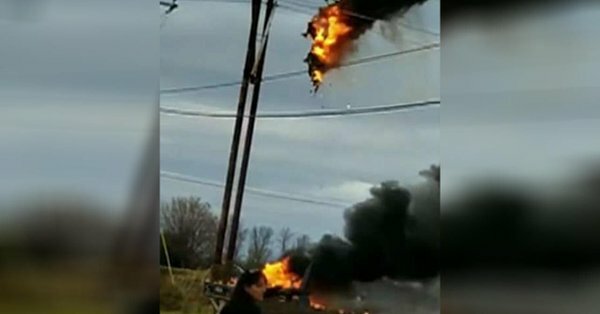 Video of the aerial accident shows the flame-engulfed aircraft striking power lines for a short while before crashing to the ground below. The chopper’s four occupants were rushed to University of Vermont Health Network at Champlain Valley Physician’s Hospital. Unfortunately, the helicopter’s pilot, Robert Hoban, Jr., 56 of Shamang, New Jersey and passenger Jeremy Keams, 30, of Massena, New York died from the accident. Two others luckily survived the incident, 34-year-old Scott Fabia and 30-year-old Benjamin McAllister. Th two were treated and later released. The helicopter is owned by Catalyst Aviation, LLC, a company based in Hammonton, New Jersey. The helicopter was contracted by Northline Utilities, of Ausable Forks, to inspect power lines. The accident’s wreckage was quickly extinguished. Vermont Electric Co-op said about 2,900 customers in the Champlain Islands were without power after the accident.